I last wrote about Terrytoons in CinemaScope over two years ago (here’s the link to my previous post on 5/28/14), so I thought it was about time I do another post on them for this site! These cartoons are very hard to find in their original aspect ratio, as they were panned-and-scanned for later television airings. Once I started collecting 16mm films, I took it upon myself to find as many ‘Scope prints as possible, as this is the only way to view these cartoons the proper way. 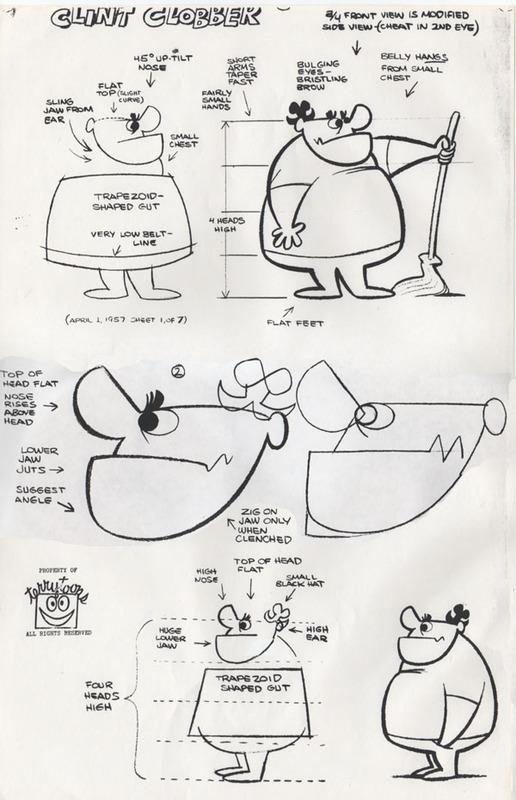 Years back, I had Tom Stathes transfer a lot of these to digital for me. Here are a few more that I didn’t get around posting last time. The first of the Sidney cartoons, and one of the best. Sidney finds himself going into hiding when he finds out that the Safari expedition has arrived, only to be offended when he is informed that they don’t want elephants. I love the walk cycle of the Safari team, as well as the animation of Sidney going “SAFARI! ?”, courtesy of Jim Tyer. The pre-credits scene and the opening theme song is often cut out in television airings. I’m cheating with this one because this transfer is not from my collection (and I didn’t even upload it), but it’s still in ‘Scope, and it’s a great cartoon, so I’m featuring it. This is the only time Gene Deitch utilized a “classic” era Terrytoons character, poking fun at the old Dinky Duck cartoons as well as the world of advertising in the era, something Deitch had first-hand experience over. This was directed by Win Hoskins, his only known credit for Terrytoons. An early entry in the Clint Clobber series. This is the first ‘Scope cartoon I purchased on film, and in spite of the opening credits spliced off I still consider it one of my best purchases. Clint Clobber falls in love with a new tenant, who turns out to be a crook on a hideout. I later got to watch this cartoon on the big screen in 2010, when Gene Deitch made an appearance at a CineFamily tribute (hosted by Jerry Beck) in Los Angeles. Mark Kausler loaned the theater his 35mm print (he also loaned a 35mm ‘scope Flebus). That experience made me realize these cartoons are best presented in a theater big screen. The original title had Clint Clobber singing “It Must Be Love”, which he also sings near the end of the cartoon. Another Clint Clobber cartoon to round up the post, this is another early ‘Scope purchase, and the print was in an almost “new” condition, making me think that this was hardly projected. In it, Clobber tries to accomidate his new tenant, a boxer, only to be intefered by a ballet dancer. Unusually, Clobber was given a flesh-colored skin in this cartoon (in others, he was usually painted solid white). That’s all I have for this post. Hopefully I’ll gain more ‘Scope cartoons to do another post on in the future! The Dinky cartoon looks as if it was specially done for use on a Cinerama screen, which basically was CinemaScope on steroids. Hyper wide-screen or not, it’s still one of the funniest Terrytoons ever, with some of the shots at television ads that are still relevant today. Ooh, this is a terrific post! Yes, I’d love to hear more of these semi-restorations of classic TERRYTOONS. I always felt that the scores got so much better in the age of cinemascope, not that one thing has anything to do with the other. I’d just like to see more of the original title sequences if they are as inventive as the SICK, SICK SIDNEY series. 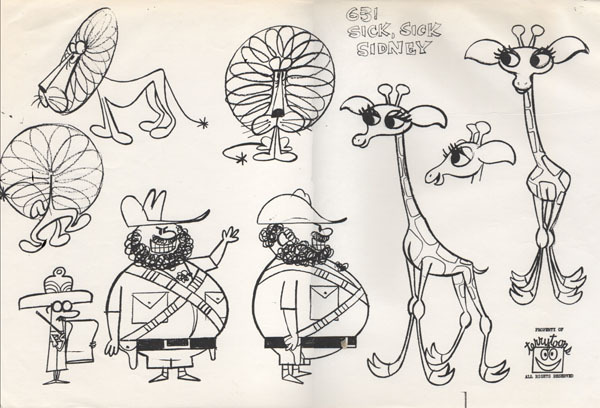 It’s a Living was one of the last Dinky Duck cartoons ever made for Terrytoons (and my all time favorite). As I remember it was basically a “clip episode” in the beginning showing several scenes from several Dinky Duck cartoon until Dinky decided to quit and walks off the big screen and decides to work for the “Go-Go TV network” but finds out being a TV star for commercials isn’t “quacked”…I mean cracked up to be. Love the parody on CBS’s Eyemark logo for Go-Go TV. Allen Swift did a fantastic job as the announcer for Go-Go TV and I wonder if Paul Frees did Dinky Duck’s voice? I was going to comment that it would be great if CBS/Paramount would put out a collection of these widescreen Terrytoons on Blu-Ray and DVD, but I couldn’t keep a straight face. I’m not even sure they know they own them. …unless the rights to the entire Terrytoons library were somehow discretely sold off recently by Viacom/CBS/Paramount to another distributor like Classic Media. I’d never see the Dinky before. Also never seen him demonstrate so much personality before either. Where, oh where, is a comprehensive Terry home video box set? Pardon my ignorance, but can anyone tell me about the tune that serves as Dinky’s theme? I know it was the theme for CBS CARTOON THEATRE and it pops up as early as in ICKLE MEETS PICKLE (1942). Is that the origin? How far back does it go? I had a list made a while back, but damned if I can find it. One of the names listed is Ralph Bakshi, who was a cel painter at the time. The faux-Hemingway dialogue of Papa Heminghunter is an absolute stich! I also idientified John Paratore in the names and he was an inker.